I feel like LEGO customizer pirie1 on Brickshelf has got some latent issues against LEGO mini-figs that he’s trying to work out. First came the beautifully grotesque Alien chest-burster custom mini-fig. 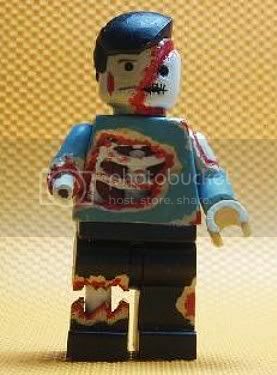 And now there’s this gruesome zombie custom mini-fig, which is strongly reminiscent of the charred LEGO Two-Face mini-fig. That’s a lot of abuse visited upon the most mild-mannered of figures in the land of toydom. Yeah, so, looking at this again… maybe pirie1’s issues with these cute little LEGO guys aren’t so latent. I’ve always wondered this about zombies: you become a zombie if you are bitten by an existing zombie, who presumably bit you to chow down on your brains and other tasty bits. I didn’t play with Legos that much when I was little – I’m from Illinois, so we mainly had Lincoln Logs, which are, admittedly, pretty awesome. These days I pass the sets in the store and totally want to buy them, but they’re a bit expensive. But man, if they sold awesome sets that included figures like this, I would feel no guilt purchasing every set that had them. So. awesome. So at first I thought that was a cake. I feel a toy turf war coming on! I hope you like dancing and knife fighting equally. the only way to stop a zombie is to destroy the brain, and zombies rarey actually eat the brain when chowin down on a body. Only a few time do they crush the skull in their ravanous hunger, or break into the head in an attempt to eat the brain. Previous post: Geek Steal: 70% off Stargate SG-1 – The Complete Series Collection!